Touring the Goodman Fielder East Tamaki plant as part of national Got a Trade Week has proved a good way for students like Bronwyn Barnes, Year 12 at Long Bay College to learn about a career in baking and how a baking plant operates. “I thought it would be a brilliant opportunity to see what it’s like to be a baker,” Bronwyn says. The Competenz Discovery Tours are an opportunity to visit a local workplace to learn about the career options available in trades and services industries and the work involved. Got a Trade Week is also a chance to hear from current trades apprentices who are enjoying the benefits of training on-the job in their chosen trade. “The trades offer great career opportunities,” says Rachel Hopkins, Competenz General Manager Marketing and Communications and Chair of the national Got a Trade campaign. “Apprentices are earning while they learn and they finish their training with a job in their chosen field – not looking for one. They’re also gaining practical skills they can use from day one and qualifications that are recognised by employers across New Zealand. Competenz customer Goodman Fielder joins 25 other companies which have generously opened their doors to host a Competenz Discovery Tour. 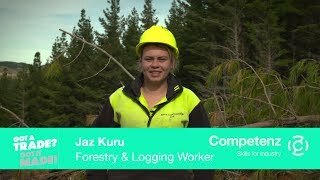 Got a Trade Week is a national campaign, chaired by Competenz and supported by seven industry training organisations, that promotes and celebrates careers in New Zealand’s trades and service industries and the benefits of learning on-the job.